The problem of obesity among children is increasing at an alarming rate. Obesity not only puts the kids at risk of serious health problems like diabetes, heart disease and asthma but also takes a toll on their emotions. 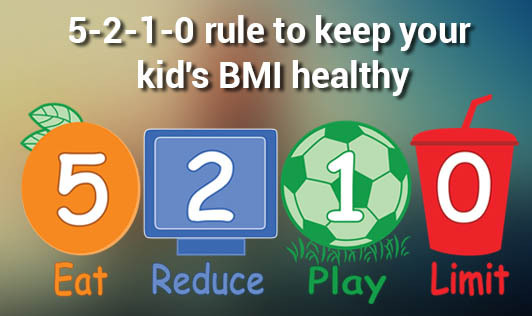 Keep your kid's weight in check and keep obesity at bay with the 5-2-1-0 rule. • Five: Include at least five servings of vegetables and fruits in your kid's diet. Keep serving them to your kids even if they don't eat them. Familiarity increases the possibility of them accepting the food. Serve them the fruits and vegetables in an innovative and attractive manner. • Two: Limit TV watching and computer games to not more than two hours a day. Kids who spend more time playing video games will get less TV time, which in turn increases overall sitting time. Also, make sure you don't keep a TV in their bedrooms. • One:Make sure your kid gets at least one hour of physical activity daily. Involve them in any kind of active sports like cycling, swimming, badminton, skipping, skating, dancing etc. They can start with small duration of time and increase later. The goal is to keep them fit and avoid obesity. • Zero: Try to keep their sugar and junk food intake zero. Include these foods only occasionally in the diet. • Start their each day with a healthy breakfast. Never skip it. • Avoid feeding fast food from outside on regular basis. • Eat your meals together as a family. • Check their food portion sizes.